Don't miss the opportunity to buy one of our beautiful and exclusive, luxury 'Class A' motorcoach rv lots in Florida. Top lots sale quickly, do not delay to avoid disappointment. Huge areas between all sites, and beautiful natural landscaping. Top notch 50 or 100 amp service. Also included are the hook-ups for city water and sewer along with wi-fi which is accessible throughout the resort. Every lot has access to the stunning clubhouse, pool and 100+ foot dock on the Myakka River. Lots of onsite activities and a great community. What are you waiting for? 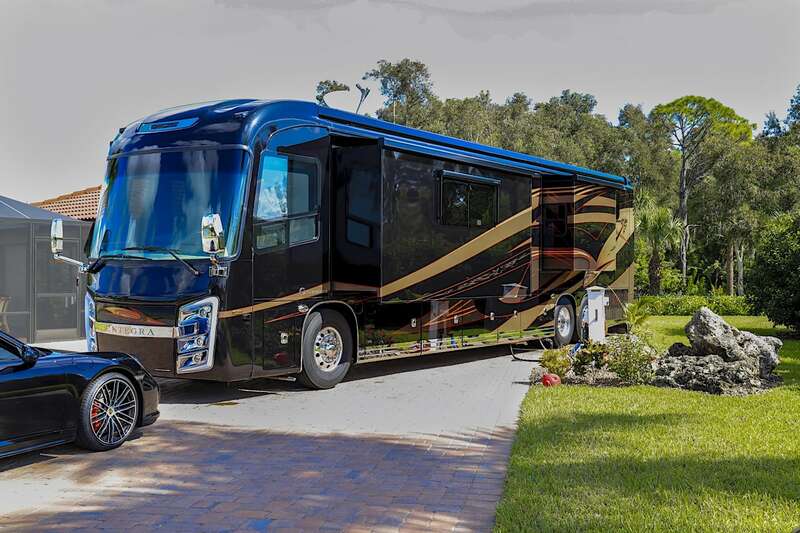 Myakka River Motorcoach Resort has some of the most beautiful and exclusive, luxury 'Class A' motorcoach rv lots in Florida. Ninety-nine exclusive and private, luxury Class A motorcoach lots, with unique site layouts. Huge areas between all sites, and beautiful natural landscaping. Top notch 50 or 100 amp service, full WiFi and sewer. Every lot has access to the stunning clubhouse, pool and 100+ foot dock on the Myakka River. What exactly is Myakka River Motorcoach Resort (MRMR)? It is a luxury motorcoach resort consisting of 30 acres of waterfront property, accented by boardwalks along the river and tropical landscaping, as well as a 6500 square foot clubhouse with Olympic size pool, spa, fitness room, indoor and outdoor kitchens, and entertainment area. The property was designed for the convenience and enjoyment of Class A motorcoaches exclusively. Any guidelines to the styles, colors and construction for casitas? Are there any guidelines to the styles and colors that can be used in the constructions of casitas? To maintain the aesthetic qualities of the Resort, a design can be selected from the existing casita plans or a design of your own can be submitted for pre-approval. The architectural style of all buildings and structures will be of or harmonize with a “Mediterranean” style. There are several color options for the exterior and roofing materials. What is allowed in the interior of casitas? A casita can be constructed up to 10% of the plated square footage of a site but under no circumstances can it be intended for occupancy. Several acceptable facilities include: storage, laundry, kitchen, bathroom, sitting area or extra room for guests. The placement of a casita on your property must be approved by the Architectural Control Committee (ACC) to protect the views from neighboring lots and the general aesthetics of the property. An additional 10% of the lot size can be outfitted with a pergola. Are there fees associated with lot ownership? There is a monthly maintenance fee which is currently $250 per month. This provides for maintenance and upkeep of the common facilities and roadways. It also includes the following for the resort as well as individual lots: city water and sewer, wireless internet access, seasonal garbage pick-up, lawn maintenance, and landscaping (limited to the original landscape design). Property taxes are the responsibility of the Site Owner and currently range from $1000 - $2300 annually depending on lot size, location, and the improvements to the site. Do you offer a rental program? If you are not using your site, you may include it in our rental program. The site owner receives 75% and the Management Company receives 25% the of the rental charges. What lots are available to rent? We always have a beautiful selection of Class A motorcoach lots for rent. Please check out our current rentals. Click here for LOTS FOR RENT. Myakka Motorocoach Resort is located in Charlotte Harbor directly on the Myakka River with a half mile of river frontage. Our Class A Motorcoach Resort is in Charlotte Harbor directly on the Myakka River with a half mile of river frontage. We are less than an hour south of Sarasota, located halfway between Tampa and Naples on the Southwest Florida Gulf Coast. Charlotte Harbor and the Gulf Islands are a charming collection of nine coastal communities surrounding the state’s second largest harbor. We’re 15-20 minutes from Englewood’s world-renowned beaches, Boca Grande, and the amazing Myakka and Charlotte Harbor State Parks. The potential of our motorcoach lots are beyond compare; from casitas to river front living...Myakka has it all. Today is a fleeting moment in time, seize the opportunity and fulfill your dreams. I own lots at 3 of the best parks in the country, and now I am selling my FL lot and buying here. This resort is over the top. 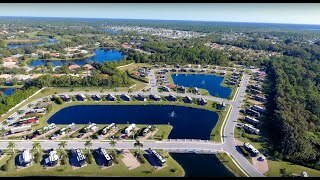 Large park on the Myakka River like a nature preserve, 100 large lots, all paved, 3 lakes with load of inhabitants...This place has it all and an energy that seems to hold everyone who comes to stay. It’s different than a lot of parks. We’ve met so many great people. We feel like we’re home. We originally only stopped here because we found the resort in a magazine and we planned to stay a week and ended up staying for months. Then we returned again for a second season and we’re coming back again! If you had a million-dollar motor home, where would you go? Keep in mind that these giants can be as long as 45 feet and can weigh as much as 10 tons! Read the full article! Our resort is all about down to earth casual luxury, and so is our sales process. No hard sales here, just friendly folks to take you on a tour and show you the highlights. We've spent millions to make this an amazing resort, and we'd love for you to come experience it for yourself. You'll see why we say it's our little secret on the Gulf Coast!